Colón was signed by the Cleveland Indians as an amateur free agent in 1993 and began his career in their minor league system. Colón made his Major League Baseball debut against the Anaheim Angels on April 4, 1997, receiving a no decision. In his first MLB season, Colón went 4–7 with a 5.65 ERA. The following year, he set the modern-day but unofficial MLB record for throwing the most pitches (20) in a single at bat on June 26, 1998 against Ricky Gutiérrez, who eventually struck out. That record would not be broken until 2018. Later that season, Colón won his only start of the 1998 American League Championship Series, pitching a four-hit, one-run complete game. In his 1999 season, Colón finished 18–5, pitching over 200 innings with 161 strikeouts and a 3.95 ERA. On September 18, 2000, he tossed a one-hitter against the New York Yankees. In both 2000 and 2001, Colón posted over 200 strikeouts, making him the first Indians pitcher, since Gaylord Perry, to record at least 200 strikeouts in back-to-back seasons. A free agent after the previous season, he signed with the Anaheim Angels in 2004. Colón won 18 games with Anaheim in 2004. During the 2005 season, he went 21–8 with a 3.48 ERA, and became the first Angels pitcher to win the Cy Young Award since Dean Chance in 1964. Due to a partially torn rotator cuff that he received in a playoff game against the Yankees in 2005, Colón spent much of the 2006 season on the disabled list with soreness or inflammation in his right shoulder. In 10 starts, Colón went 1–5 with a 5.11 ERA. ^ "Bartolo Colon Stats". Baseball-Reference.com. Retrieved April 21, 2019. 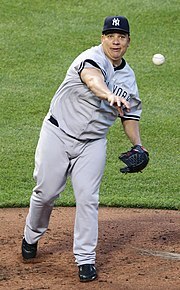 ^ "Bartolo Colon Stats, Fantasy & News". MLB.com. Retrieved April 21, 2019. This page was last edited on 21 April 2019, at 11:49 (UTC).